Last week I was at a potluck lunch at my daughter’s school and someone brought in Anzac biscuits. 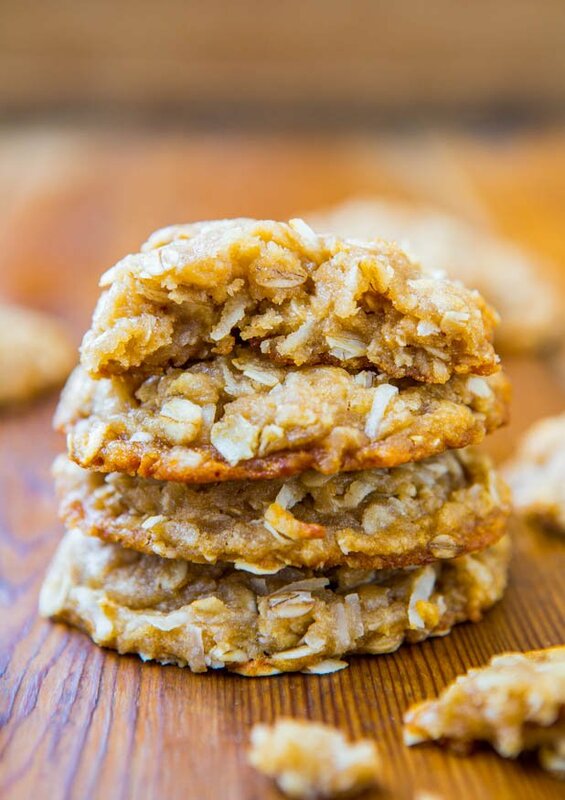 They were soft, chewy, full of oats and coconut, and I knew I had to recreate them. I’d been wanting to make them for years, but tasting them gave me the nudge I needed. More like a huge push to research recipes and come up with something. That night. I wasn’t going to bed until I recreated them. It’s been suggested that the biscuits were sent by wives to soldiers abroad because the ingredients do not spoil easily, and the biscuits kept well during slow, long naval transport. There’s no egg in the cookies and while there is a stick of butter, I have a feeling you could successfully keep them vegan by using a vegan butter substitute. 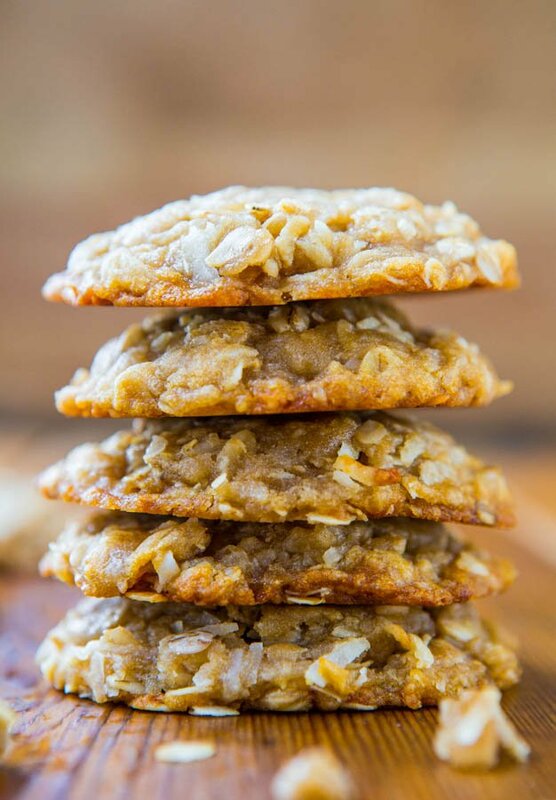 While I love the lineup of ingredients – brown sugar, oats, and coconut – I had previously read that the cookies were crunchy and crispy, adjectives that don’t belong in my cookies. However, the cookies I tried were soft and chewy, sealing the deal to make them. I ran into the man who brought the cookies to the potluck, and he told me he used Bill Granger’s recipe, a Sydney chef and cookbook author. I found the recipe online, but I had already made these cookies by the time I ran into him and googled the recipe. As an aside, today is National Oatmeal Day. How fitting. You don’t need a mixer for the recipe and instead just stir the dough together. Begin by melting 1 stick of butter in the micro, stir in brown sugar, oats, coconut, honey and maple syrup. Most online recipes call for golden syrup. It’s very rare to find it in U.S. grocery stores, and it’s an online order. I refuse to ask my readers to order an ingredient online that you need 2 tablespoons of, so I substituted with a blend of honey and maple syrup. I used more liquid sweetener volume than most recipes which call, usually 1 to 2 tablespoons. I used 4 tablespoons because I didn’t want the batter to be dry. I used sweetened, shredded coconut. 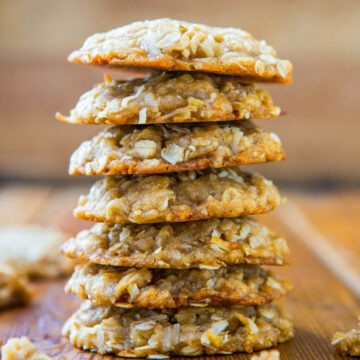 I know I’ll be asked about using unsweetened coconut, and while the recipe will work, I don’t know how the cookies will taste. I used old-fashioned whole rolled oats, not quick cook or instant. 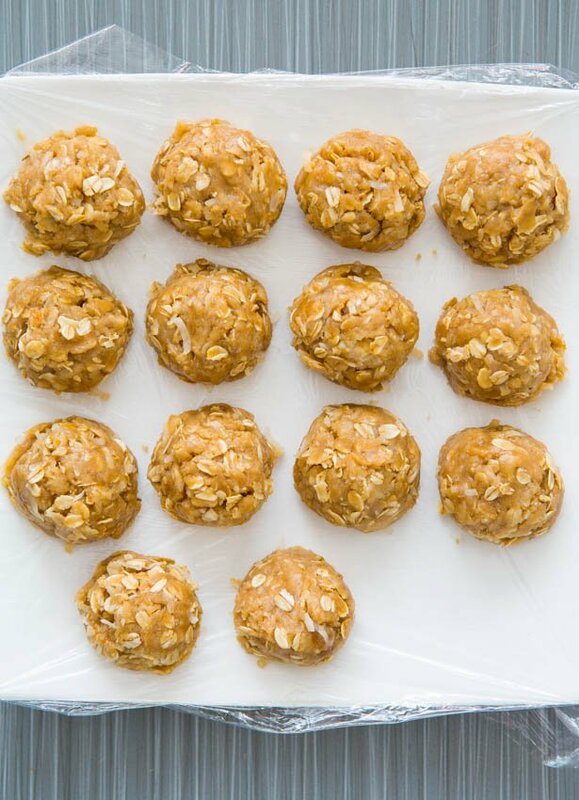 Don’t use quick cook because they function more like a coarse flour, and will absorb too much moisture from the dough, rendering it dry and crumbly. Plus, I love the texture of big oats, not pulverized pieces. After stirring in flour and baking soda, the batter will look something like a streusel topping. Fluffy and loose, but when squeezed together, compacts to form a dough. To help squeeze and compact the dough into mounds, I used my cookie scoop. Then I chilled the dough mounds overnight before baking. And about midnight I ate two of the dough balls. It’s incredibly good dough and no eggs (not that eggs ever stop me). I wanted to eat more but told myself to walk.away.now. It’s a small batch recipe, making only about 15 cookies, and I needed enough to actually bake with. 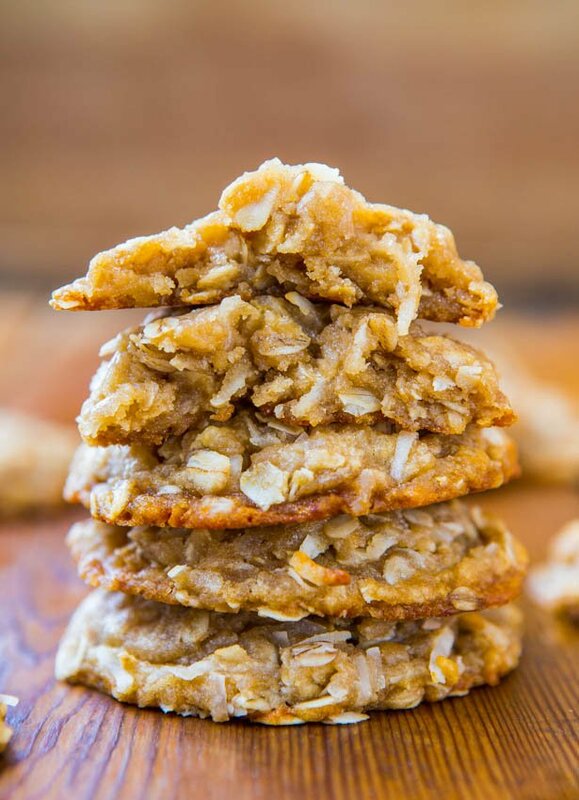 Traditional Anzac cookies are usually very flat and thin, but I don’t prefer overly flat cookies, so I chilled the dough because cold dough spreads less, plus it gives the flavors a chance to marry. I baked my cookies for 9 minutes and the edges were just starting to brown, while the centers remain soft and tender. 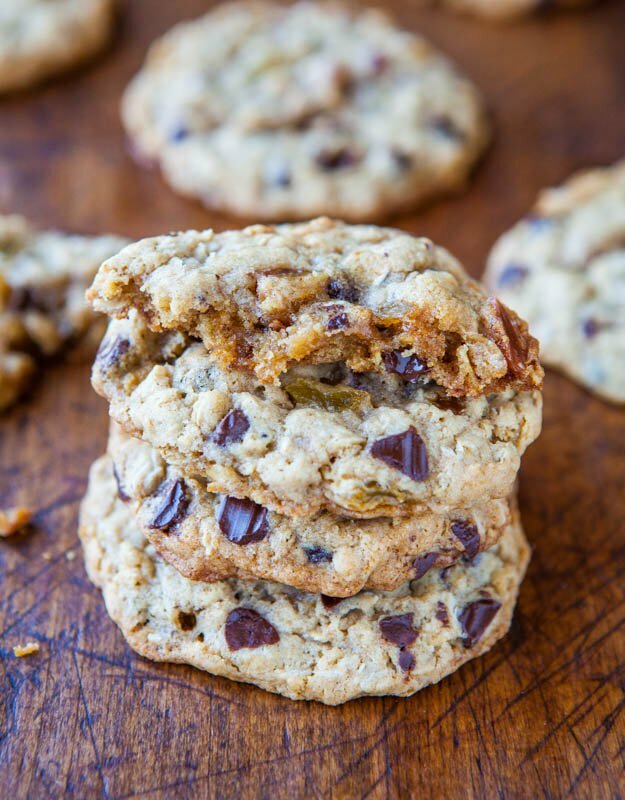 The cookies are exceedingly moist, very soft and very chewy. They’re a touch greasy or oily, but I don’t view that as a bad thing. I view that as a buttery-goodness-with-no-where-to-go-but-to-the-surface thing. If you prefer drier, firmer cookies, reduce the liquid sweeteners to 1 tablespoon each of honey and maple syrup, and bake for an additional minute or two. The abundance of texture from the oats and coconut is so my thing. 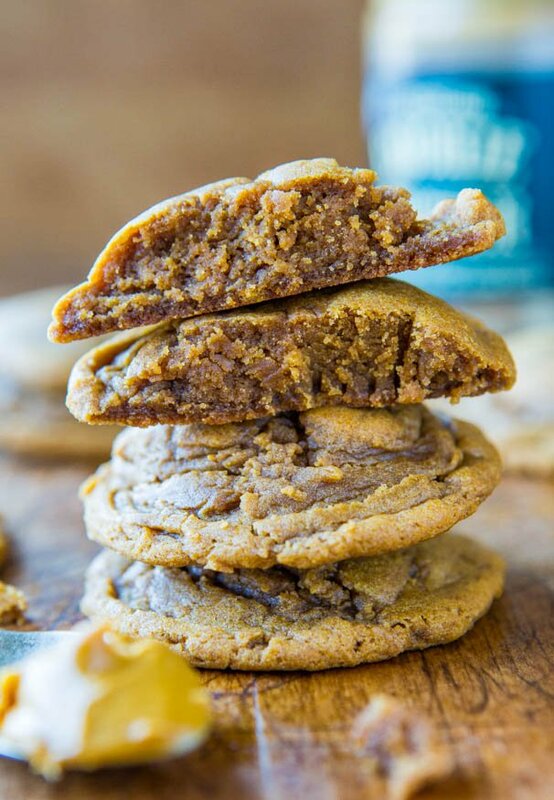 Along with the flavors from the honey, maple syrup, and the butter and brown sugar that caramelize while baking, these sweet cookies have layers of rich flavors that just won’t quit. I’m so glad I went to that potluck because this is a bucket list cookie I’ve had on my mental to-make list for years, and now happily can check it off. 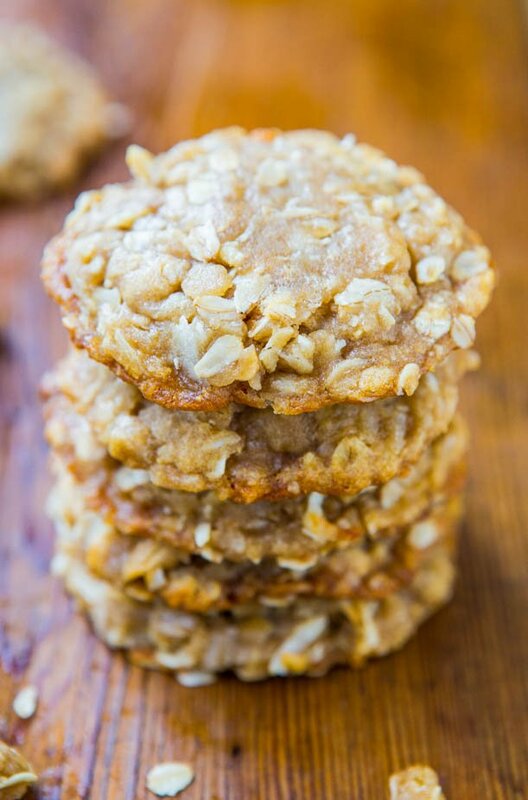 These cookies are a soft and extra chewy version of the classic Anzac biscuits (read more about it in the blog post). 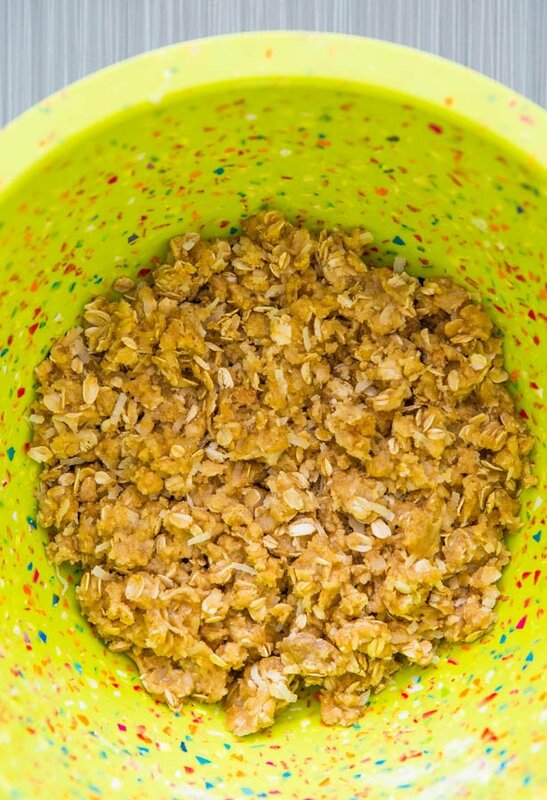 They’re so fast to make and you don’t even need to use a mixer. 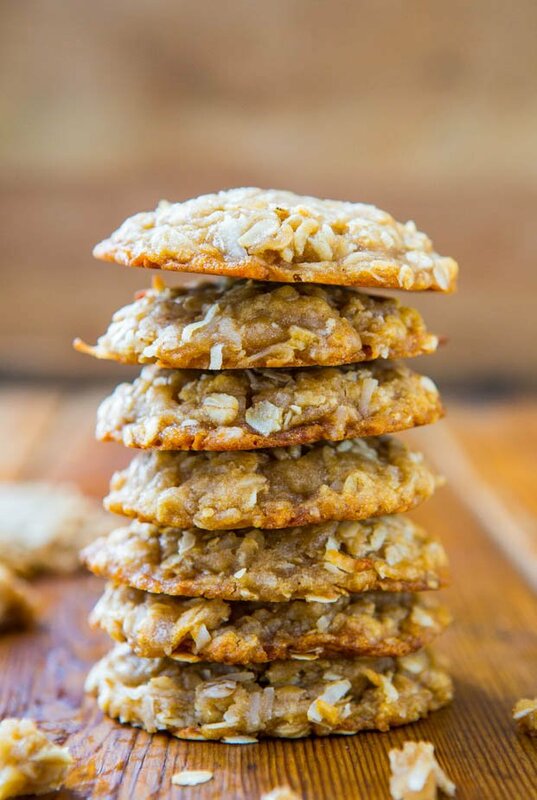 The flavors of the coconut, honey, and maple syrup, along with the butter and brown sugar that caramelize while baking, give the cookies layers of flavors and an abundance of textures that just won’t quit. 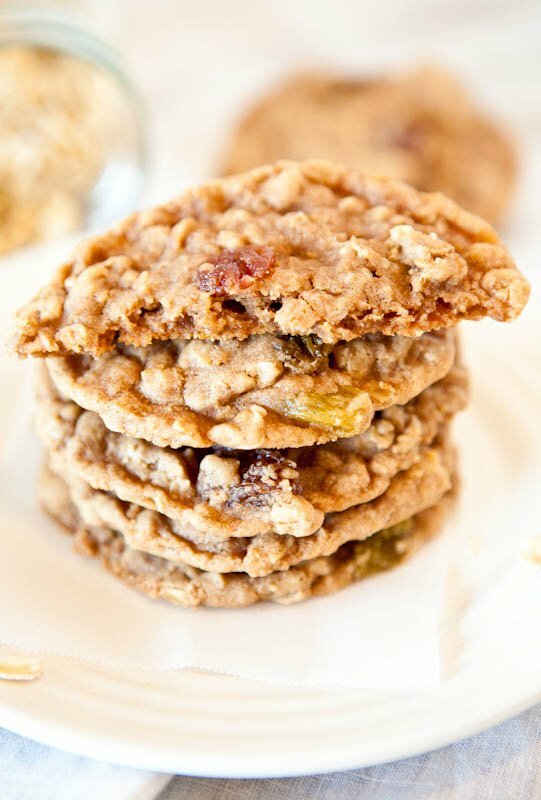 The cookies are exceedingly moist with soft, tender interiors and firmer, crispier edges. 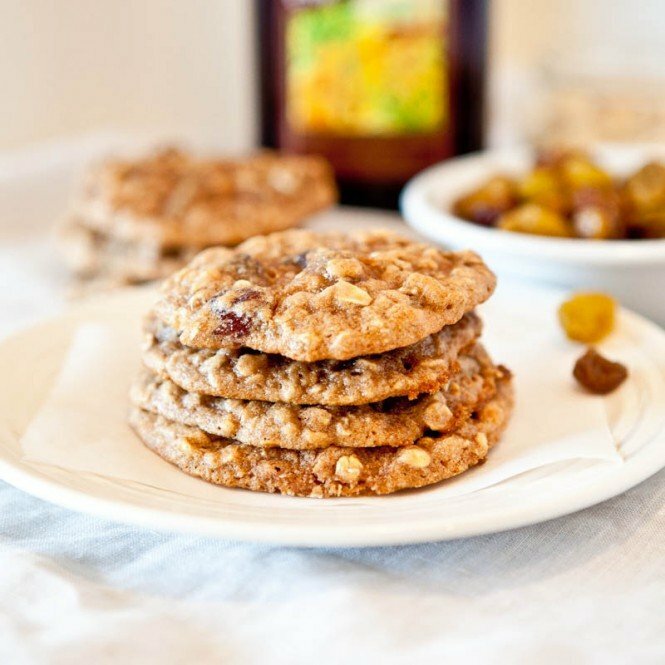 If you prefer drier, firmer, crisper cookies, reduce the amount of liquid sweeteners to 1 tablespoon each of honey and maple syrup, and bake for an additional minute or two. If you have access to golden syrup, you may wish to use it in place of the honey and maple syrup. Preheat oven to 350F, line baking sheets with Silpats, or spray with cooking spray. Place mounds on baking sheets, spaced at least 2 inches apart (I bake 8 cookies per sheet). Bake for about 9 minutes, or until edges have set and will be just beginning to brown (the coconut in the dough is prone to burning so watch them) and the tops are just beginning to set, even if undercooked, pale, and glossy in the center. Do not bake longer than 9 to 10 minutes for soft cookies because they firm up as they cool; bake for 10 to 12 minutes if you like firmer, crisper cookies (The cookies shown in the photos were baked with dough that had been chilled overnight, allowed to come to room temp for 10 minutes while oven preheated, and were baked for exactly 9 minutes). 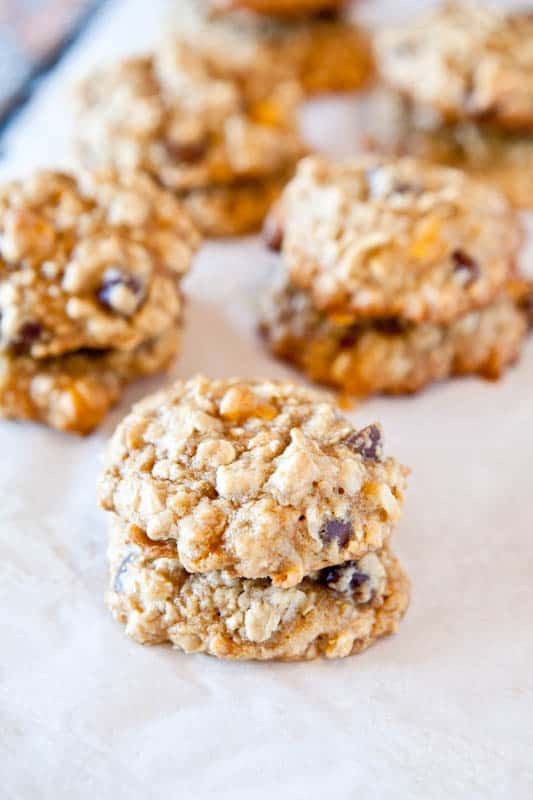 Allow cookies to cool on the baking sheet for about 5 minutes before removing and transferring to a rack to finish cooling. 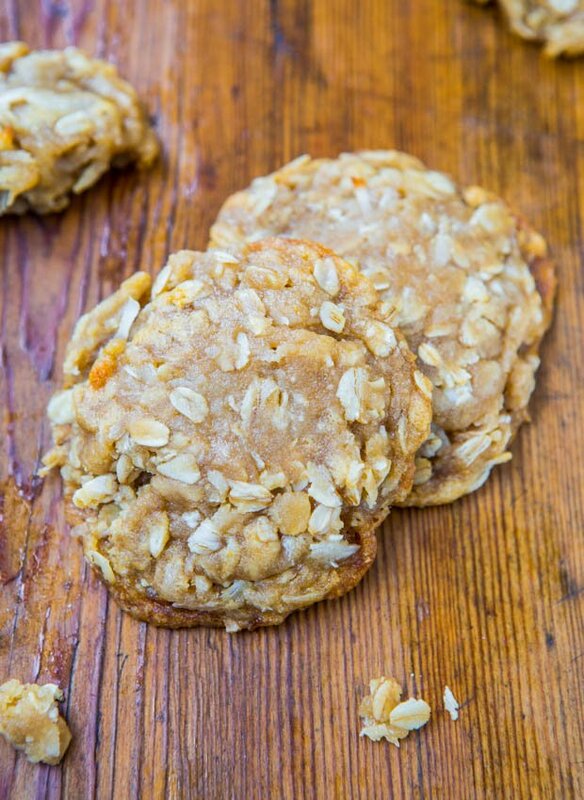 Have you ever heard of or made Anzac Biscuits? Thanks Averie, I checked the baking soda and found it expired in 2009. I just bought it yesterday at Target! I will definitely check next time and I will try and make the Anzac cookies again. Target should be ASHAMED of themselves!! That’s AWFUL!!! Bring it back the next time you’re there. They deserve to eat the costs of that one, even though it’s cheap, but still. Ugh! Yes, try again with functioning baking soda (if it doesn’t bubble, it’s bad) and you will be fine. Keep me posted! 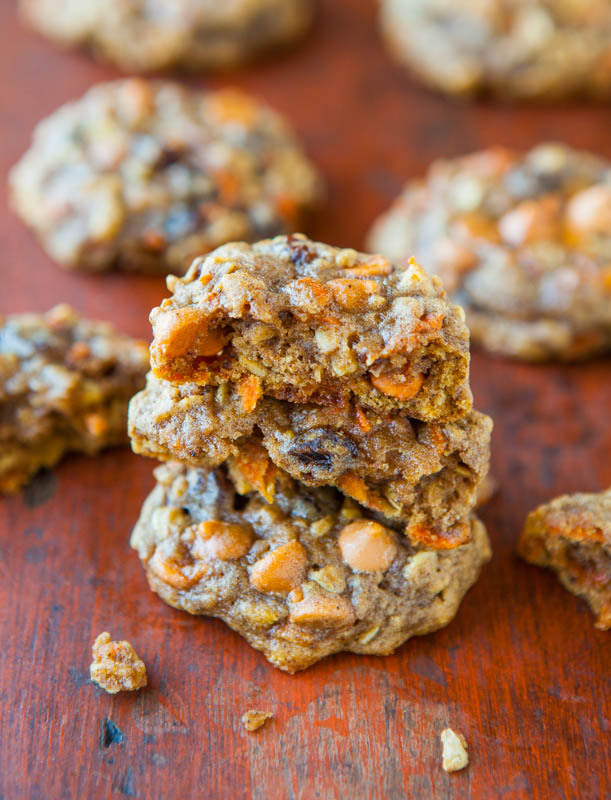 These cookies look so delightful :) I love the flavors you used! You should try the recipe with more salt. 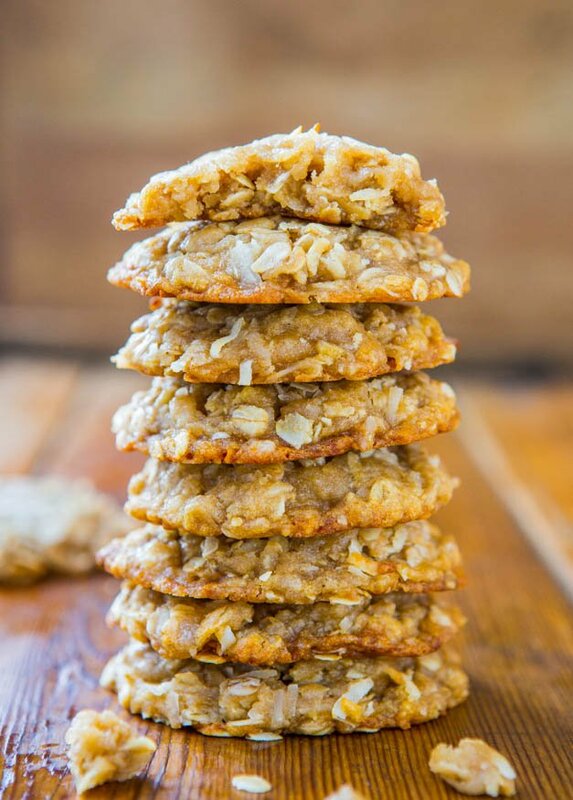 Traditional ANZAC biscuits have more salt in them- not only does it enhance the sweeter flavours (so you don’t need to use so much!) but the salt was also a natural preservative. *1st gen Australian, NZ parents. The pictures of your biscuits look delicious! Can’t wait to bake them – just wondering when you add the butter? I probably have just overlooked it, but can’t seem to see where you are supposed to add it? In a large, microwave-safe bowl melt the butter, about 1 minute on high power…. Hands down the best cookies going! Thanks for the heads up on the chilling, its a must. Sooooo good! I made these recently and I really liked them. My son doesn’t like coconut so they actually lasted for a few days. :) I made them just a little different…didn’t let them sit in fridge or make them flat. But, I will be trying that soon! Here is the link to my version. http://wp.me/p5P7wr-af Thank you for this great recipe. Thanks for trying the recipe and I’m glad you enjoyed them! It’s so warm this time of year and I think baking in the heat/humidity does change the consistency of doughs. I think you’ll be fine after it chills. Glad my recipes have never failed you! Alright so these turned out a bit soft which was a bit unfortunate, but they still tasted good. 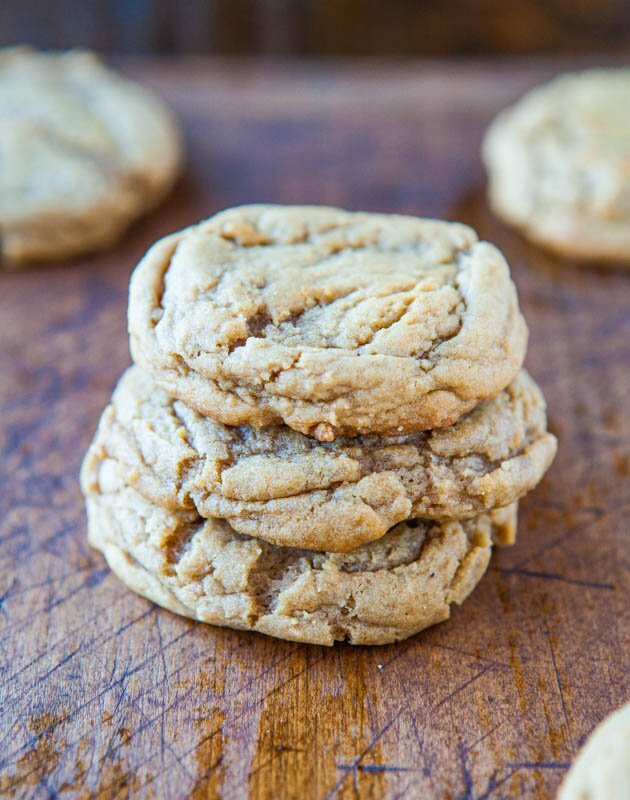 I got some really good golden brown caramelized brown sugar edges to the cookie which were great…I might try make these again, and maybe just bake them for a bit longer at a slightly lower heat so they don’t brown as fast..
You could try a touch more flour and/or oats. Just to firm up the dough a slight amount. And of course you can always bake longer. All ovens and climates vary so just bake as long as you think they need in your situation. Thanks for trying the recipe. 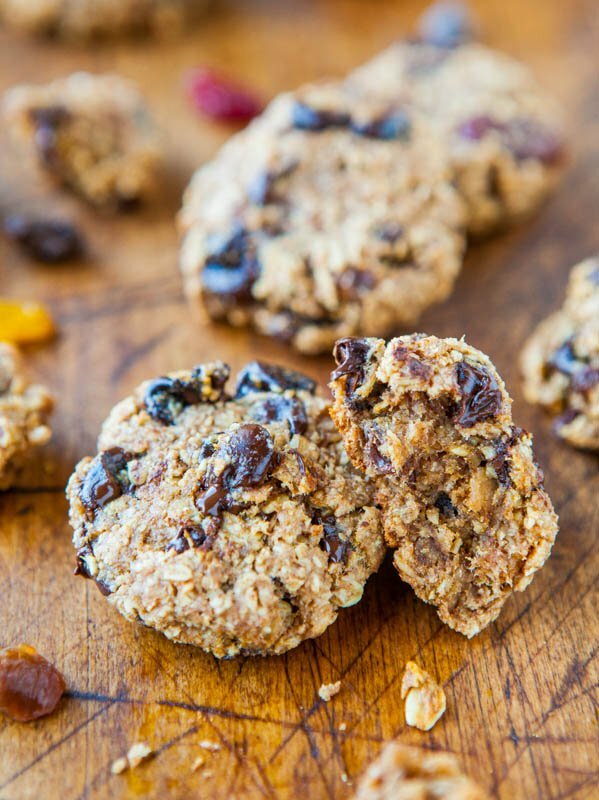 I love these cookies so, so much with the addition of a little spice (1.5 tsp cinnamon and 0.5 tsp ground ginger). I’ve made them at least four times. I always take time to toast the coconut; toasted coconut is just magical to me. … just realized I forgot the vanilla extract though. Oh well, there’s so much taste and texture to these cookies I don’t miss it a bit. Glad you enjoy the recipe and have played around with it and love it! I made these last weekend. OMG the dough!!! so yummy!! I had to avoid the fridge. Then I baked them up. Got varying degrees of flat cookies with nice crunchy bottoms and smaller, taller chewier cookies. This was due to my inconsistent sized balls. Loved them all though!! Definitely a keeper of a recipe! I used unsweetened toasted coconut and toasted oats with 1 cup of brown sugar and 4 tbsp of syrup. After cooling for 20 mins or so, I firmed them up in the freezer. Very manageable if you use parchment paper. Thanks for sharing this great recipe. Thanks for trying the recipe and glad you enjoyed! 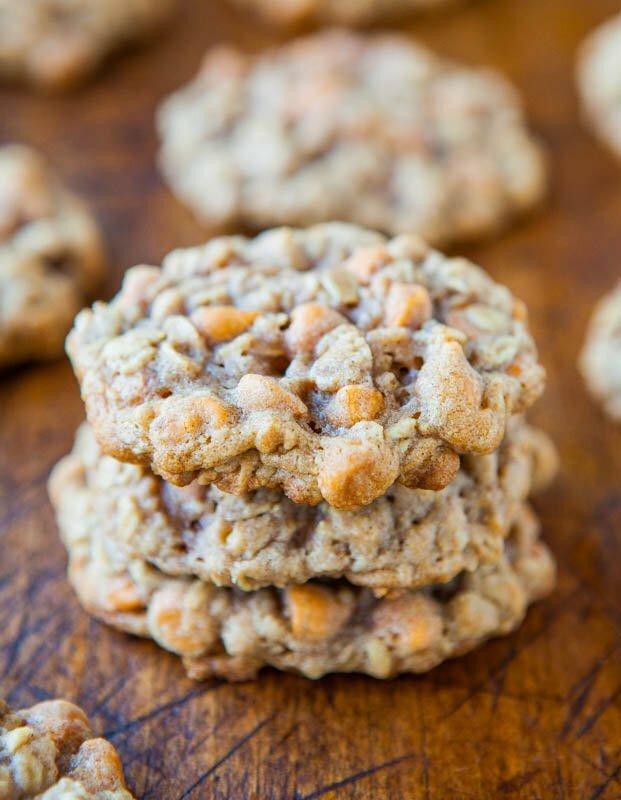 Just tried to make these… we LOVED the flavor but they came out sooo flat! I thought we just didn’t chil them long enough but just made another batch that sat overnight.. still super flat! What do you think could be the problem? I would increase the flour then. Baking is one of those things that it’s not always an exact science given all the variables with ingredients, climates, ovens, etc. I would add another 1/4 cup or so of flour, enough to nicely stiffen up the dough. And I would also replace your baking soda and start over. One of those things that for 99 cents or 1.99, the fresher the better with baking. Also bake on a Silpat baking mat if possible. Thanks for the 5 star review and glad you love the flavor. Those tweaks should get you where you need to be with puffier cookies. Can coconut be omitted or substituted? Thanks! In this recipe no because it´s a pretty big amount and is necessary.